Can you help my Reactive dog? This is a question I get all the time! You get a dog for your life and for your family because of all the pleasure it’s going to bring you. You’ll be able to care for another creature, teach her and nurture her. You’ll be able to go for long tramps across hill and dale, enjoy a coffee at your local cafe, with friends. You’ll be proud to show off your dog to visitors to your home, and go for group walks with others and their pets in the park. It just didn’t work out that way for you. Your dog is difficult. She barks at all comers. She shows her teeth to other dogs. You daren’t let her off the lead for fear of what may happen. And as for sitting quietly in a coffee shop or enjoying family visiting your home … that seems a pipe-dream. And naturally you are grieving for the loss of your dog. The dog you thought you were getting. I get that. I really do. But all is not lost! You really can enjoy many of those things. But you have to change a few things first. You think I mean you have to change your dog, don’t you! But no, I don’t mean that. What you have to do is change what you’re thinking! Yes, really! It’s not about teaching your dog a different way to be. It’s about looking at a different way YOU can be. A better way to reach your dog’s mind and make the changes you so devoutly desire. Many people come to me in a state of near-despair. They think it’s all their dog’s fault. Or they think it’s all their fault. Can you imagine the relief when they find that it’s neither their dog’s fault NOR their fault? And the flood of relief they get when they find how easy it can be to change things - once they make the changes to their own thoughts first! I am touched that I have been able to help these good people and their equally good dogs! And their results came mainly from how those owners changed their own thoughts and feelings about the whole “reactive dog” thing. So, in an effort to reach more of you, and to help transform the lives of even more dogs and their people, I’m running a 5 Day Live Workshop specially for Growly Dogs (that’s shy, anxious, reactive, or aggressive, dogs) - entirely free. I’d love you to come along and start on your own new journey with your much-loved dog. Click here to find out just what you’ll get and how to sign up! This could be your story too! Tagged: growly dogs, reactive dogs, reactive dog training, anxious dogs, shy dog, dog barking and lunging, FREE Workshop! We call it “Wigwam” (it just seemed to describe it well). I know that she’s doing this to get reassurance. She needs to feel that we are her people, her protectors. She’s anxious by nature, and you can hear her sigh and see her whole body relax as she wigwams. But it took me a while to make the connection which explains why she does it. The muzzle-grab is what an older dog may do to a younger one, perhaps a puppy who is getting out of hand. They open their mouth wide, and wrap it right round the pup’s muzzle to keep it shut. The teeth are covered - it’s not intended as a bite. It’s a very clear way of saying “Keep your mouth shut near me,” is painless, and effective. 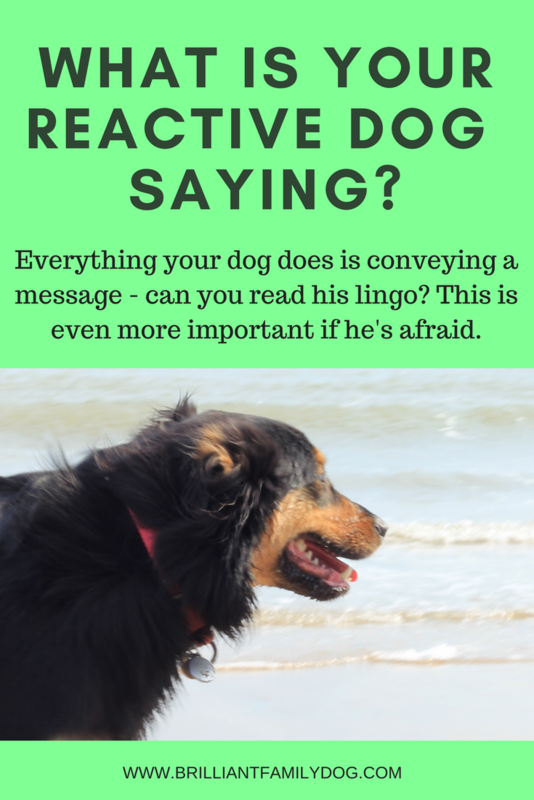 Get the lowdown on why your reactive dog does what he does, and how to start a major change! Success! Now check your email to download your first lesson. The remaining lessons will come to you by email over the next few weeks - giving you time to implement the steps in each lesson. Those hippo jaws that dogs play with are a precursor to a muzzle-grab, if they can get in the right position. But here’s the key: sometimes a dog will solicit a muzzle-grab from an older dog or a companion. This is to be reassured that they are still part of the group, meriting the kind of action normally directed to a puppy. They are loved and cherished, in other words. They feel they belong. It’s a bit like a cat purring to provoke affection, or a puppy nuzzling a hand for pets. And this is what Lacy is doing to us. She is provoking a muzzle-grab by pushing her head between our knees. She is putting herself in this vulnerable position - her eyes covered, her head trapped - to seek that feeling we all need to experience regularly. To feel loved and protected. I knew what Lacy was doing. It satisfies my curiosity to know why. This is just a glimpse into the complex and sophisticated body language dogs employ. We - especially the British with our history of empire - tend to expect everyone else to learn our language. If they don’t get it the first time, we shout at them! And this is how many people treat their dogs. They assume because their dog doesn’t understand their words she’s being deliberately obtuse, stubborn - or just plain stupid. This is so unjust! If we can just take the time to learn our dogs’ sensitive body language, not only do we have a new way of communicating with them, but SO MANY misunderstandings will be avoided! It’s not difficult to observe and note what our dog is saying to us. But many dog-owners have no idea. They just don't see it. They prefer to act the sergeant-major and shout at their dog. It’s especially important to be able to understand your dog if she has reactive tendencies - fearful, anxious, shy, aggressive - a Growly Dog in short. Once you can understand how your dog actually feels in a situation, it makes it so much easier to get a good outcome. This is definitely not a time for yelling ever louder at your “thick” dog! This is something I go into in great detail in my course for reactive dogs: From Growly Dog to Confident Dog, and which brings lots of “Aha!” moments to students, who begin to see a way forward, at long last. Go and check out the course, read the students' success stories, and think how this could change life for you and your tricky dog. Following the feedback from the present students, the course has been updated and now has everything asked for. For a quick start, check out this mini-course!